You'd love the idea that this house is surrounded with a pool and a garden. When a house is located in the city, it would really be challenging to design it in a manner that it would bring privacy to the area. Like all homeowners, one would want it to have privacy while having a secret hideout in the middle of the noisy urban streets. It may sound impossible to own a space like this but with the creativity and innovation of designers, nothing is impossible. 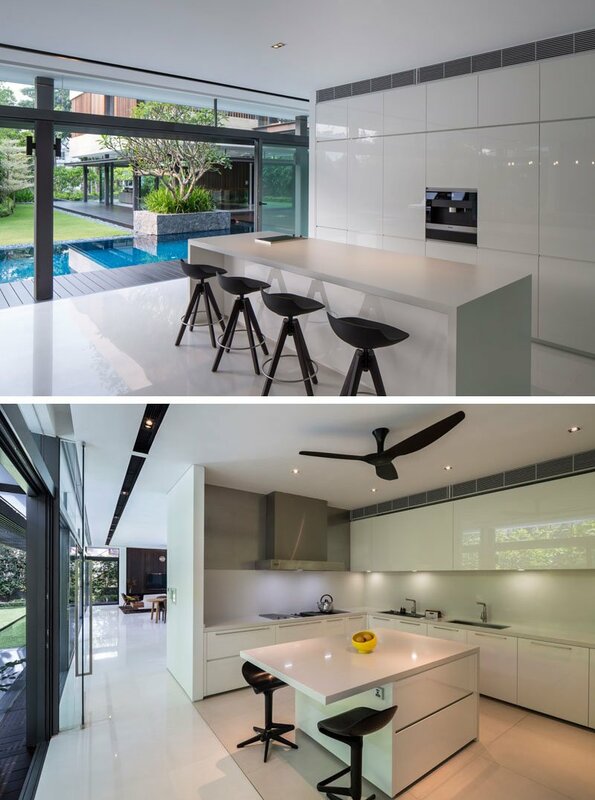 The Secret Garden House is situated in the good class bungalow area of Bukit Timah. 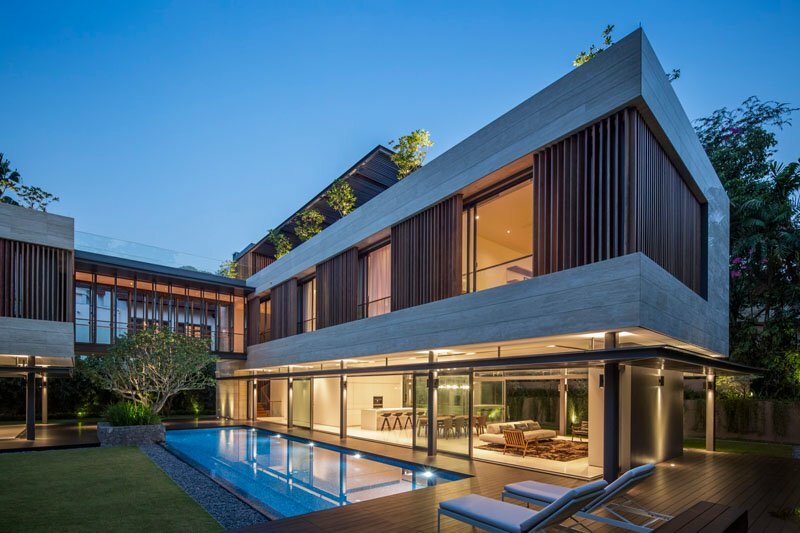 The owner’s brief was to have a luxurious, tropical, contemporary family home. Being the owners of a construction company and by building it themselves, it would also showcase their professional capabilities. The house sits on an L-shaped site with a narrow and unassuming frontage. On all sides, it is surrounded by neighboring homes. Further, in and on a slight rise, the bulk of the land is not visible from the entrance. Most local home buyers would regard the uneven terrain, narrow frontage and lack of prominence as a disadvantage. The architect saw an opportunity in using the terrain to camouflage the bulk of a large house, and the lushness of a secret garden to screen it from prying eyes. Unique feature: A stunning contemporary home with lush secret garden, a cave-like entrance, a water feature and many circular skylights. The homeowner wanted to have a house that is luxurious, tropical, and contemporary family home. You will see in the next images how the designers managed to satisfy the project brief o the owners. 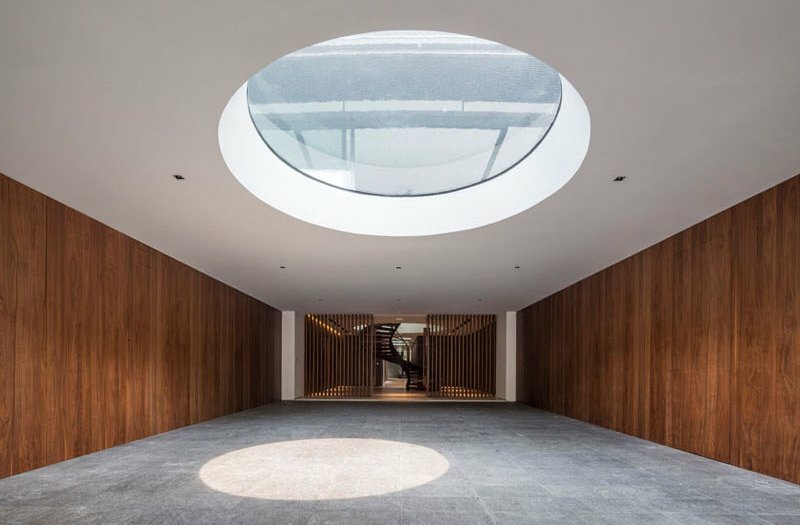 Visitors are welcomed into the house via a granite cave entrance leading to an ‘underground’ lobby. Upon entering through the gate, the home starts to reveal itself and a cave-like entrance guides you into the home. Above ground, the lifted bedroom blocks are kept passively cool by layers of masonry, air cavities, travertine stone cladding, roof gardens, and pergolas. 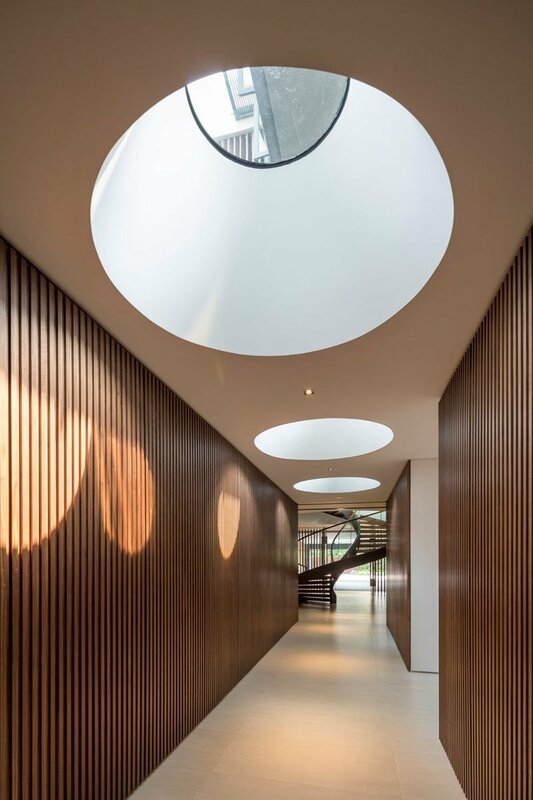 Windows cut heat entry via low-emission glass and timber sunscreens filter the strong tropical sunlight, and transform it into a pattern of light and shadows that play into the interior spaces. Through the ‘cave-like’ entrance there’s a skylight, however, the skylight shows water from the water feature positioned directly above. Going further into the home and past a spiral set of stairs, there’s a hallway with additional skylights (this time no water) and access to the second set of stairs. Skylights further animate the experience in the course of the day through ever-shifting shafts of light. When the situation necessitates, the entire home can be closed off to tropical rain storms or the haze from pollutive burning. Down the hallway, there’s a multipurpose room and an entertainment room. There’s also the laundry, storage room, steam room, bathroom and a lift. This ‘plateau’ ground level was planned to be a space that blended indoor and outdoor, soft-scape and hard-scape. It was to be one space, with several programs, rather than many spaces with determined boundaries and fixed functions. Trees planted heavily around the perimeter from a very private enclosure. Visually secure from outside, the ground plain architecture could then be open and transparent without the owner’s privacy being compromised. An outdoor living deck and roof garden tops-off the composition, and is usefully spacious enough for social gatherings and parties. 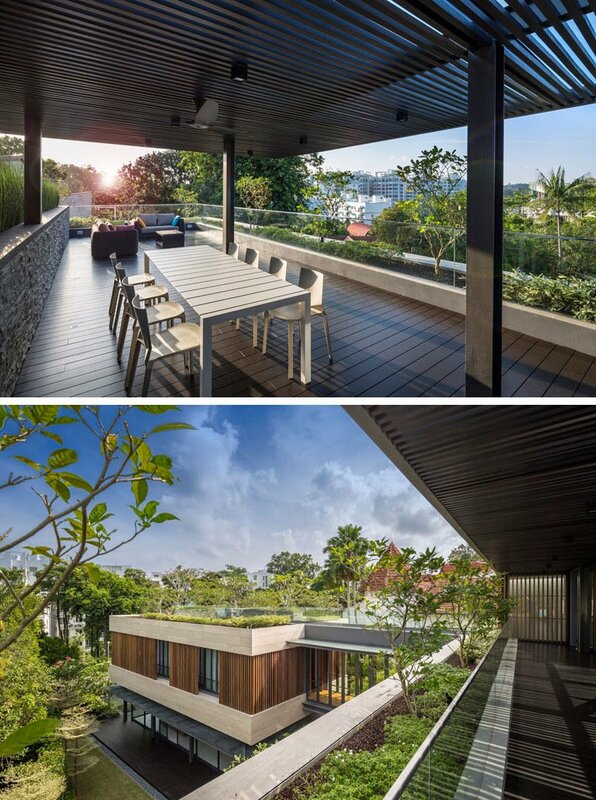 The deck’s facing is angled to enjoy views to scenic Bukit Timah Hill, the highest point in Singapore. This is a living area situated at the upper level. This can be found at the top of the spiral stairs. It opens up to the garden and a water feature. Aside from the living area upstairs, there is also one on the ground level which you can see here. It sits in an open layout along with the dining area and kitchen. 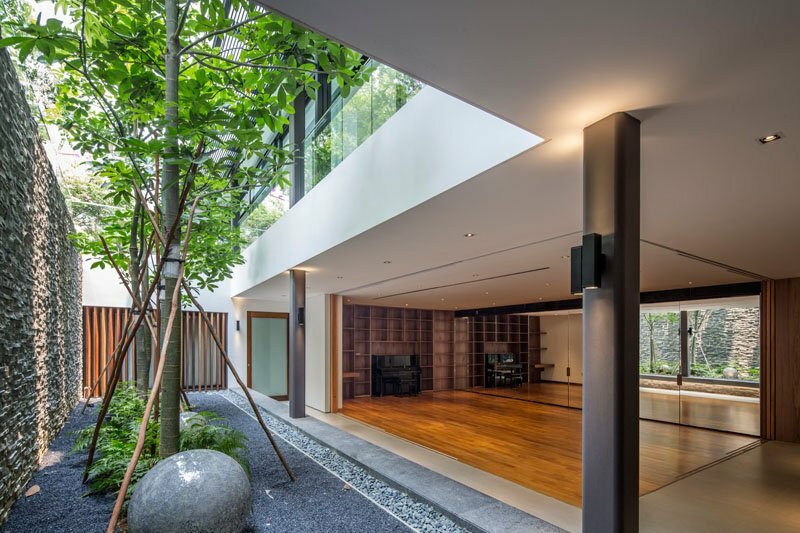 This floor of the house was planned to be a space that blended indoor and outdoor as you can see with the doors of the dining and kitchen areas opening up to the garden and pool. The kitchen is split up into two areas, a dry kitchen, and a wet kitchen. The dry kitchen does not have any water available or cooktop, it’s more for serving, however around the corner is the wet kitchen, with everything that a normal kitchen would have. Seen here is the entertainment room that opens up onto a landscaped garden. Isn’t this very relaxing? The prominence of a steel and glass spiral staircase leads visitors up to the living room. 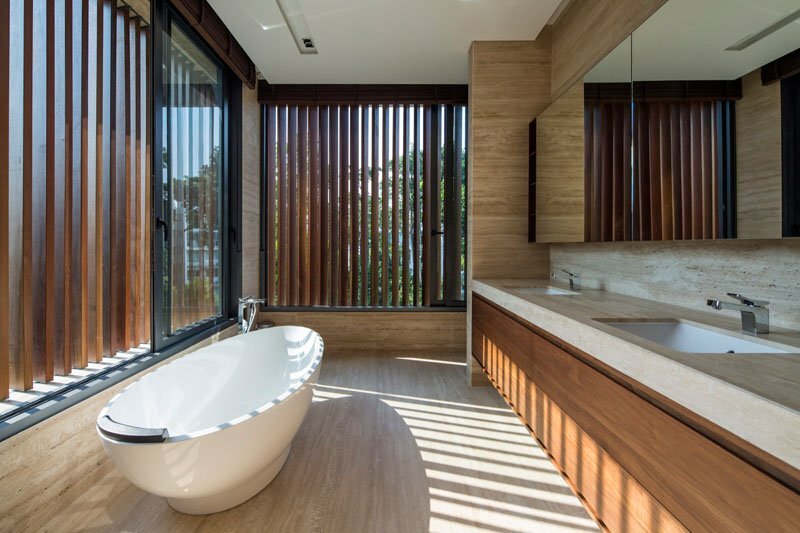 The bathroom is very spaces which are wrapped around with louvers for privacy. In spite of being on an intensely urbanized island, especially being one of the highest population densities in the world, the Secret Garden house recaptures what it is to privately enjoy living in the tropics, with its lushness, vibrancy, and beauty reflected by its garden. 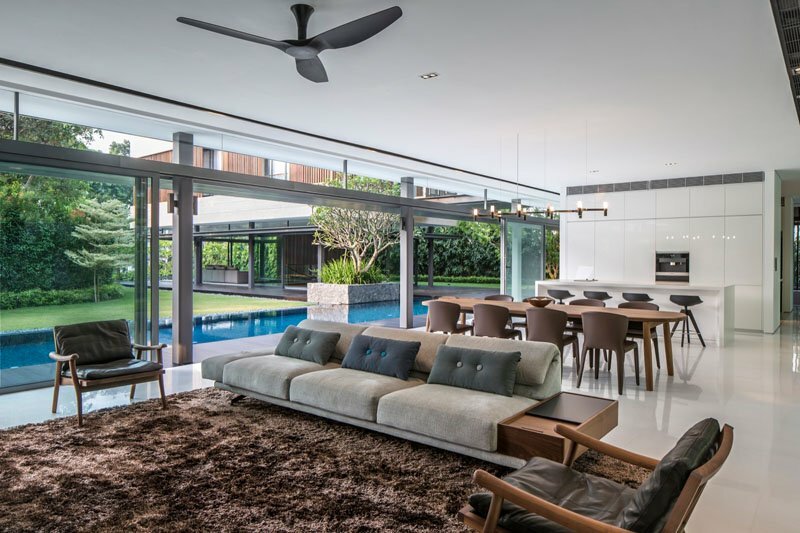 The Wallflower Architecture + Design worked on the design and layout of this beautiful home which separates the interior living spaces from that of the outdoor areas. Isn’t this a lovely home?